Unique camera setup hopes to be ultimate phone companion. 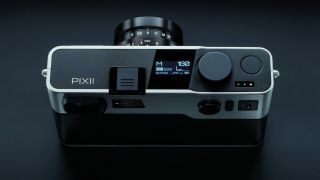 PIXII may not be a household name, but it is set to launch something quite different in the camera market. The camera is a digital rangefinder that, instead of having its own screen, will work with your phone. The company is calling it a "connected digital camera with rangefinder viewfinder" and has explained a bit more about what we can expect from the camera and how it was inspired by the smartphone. "The smartphone has become, by and large, the number 1 camera in the world. At the same time, the traditional camera market has collapsed. Was it killed by the smartphone? No, photographers just aren’t interested in old cameras anymore," PIXII explains. "This is the end of the line for the digital camera designed in the 80s: a sensor, a CPU and a screen. All of these components were necessary back then. Because computers were rare and hard to use. "Except it's 2018 now. Who seriously needs a fixed function computer and a bad LCD at the back of a camera? Pixii is the fusion of 2 essential elements: the physical camera body and the software, virtualized into an app, that dynamically develops the picture on a screen." The camera is a whole lot lighter than Leica's rangefinders, at 460g, and its sensor setup is impressive. It comprises a CMOS sensor, 5.5µm pixel pitch, Global electronic shutter, 12-bits sampling rate, and high dynamic range (60-90dB), APS-C optical format, RAW (DNG) and JPEG format (4080x2732) with an ISO of 200, programmable from 100 to 6400 ISO. It uses an M compatible lens mount, has a machined aluminium body with dimensions 138x79x33mm. More specs can be found here. The PIXII is launching in Europe 14 December and you can expect to pay 3480 euros for the PIXII A1112, 8GB silver aluminium, and 3540 euros for the 8GB space gray or black variant. Given a Leica usually hovers around the £5,000 mark, that's expensive but a solid price for a rangefinder.